When I left my house this particular soggy morning, I wanted to capture some interesting moments in Chinatown that included umbrella's. So when I saw the match going on at this table I went straight for it. 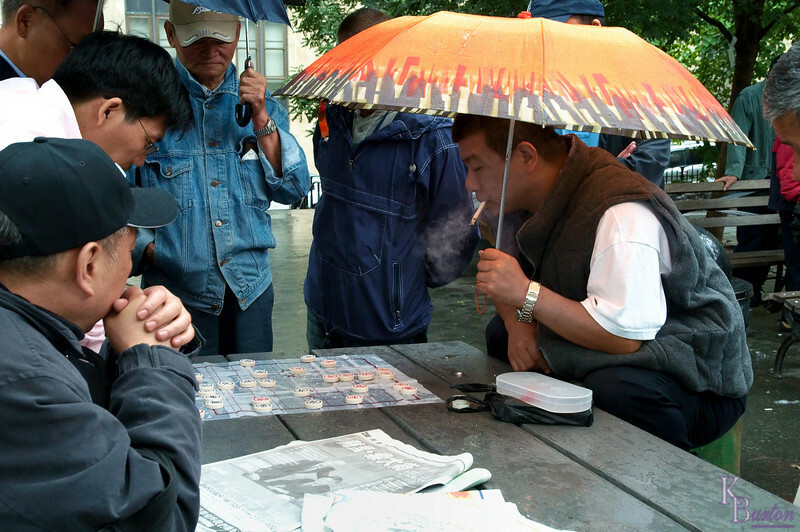 I wanted a shot of everyone looking at the chess board which was sopping wet from the rain, to increase the drama, but the man on the left was intently reading his newspaper instead. Given the amount of people around this particular table I guessed that it was a very good match, and that sooner or later the ebb and flow of the game would draw his attention back again, and he would finally put his paper down. My hunch was correct. Then I just waited for the player on the right to let out a nice long drag of cigarette smoke, which would stand out nicely because of the navy jacket behind it, if the man wearing it didn't move, which as fortune had it, he didn't. As soon as I snapped the shutter I knew I had one heck of a shot. Great capture and thanks for the story attached. Very well captured - I like the fuming cigarette and the tension! Three things I like about this photograph: 1. I find it interesting that he is taking this opportunity to stretch this legs in this deep yoga position 2. especially when he is also trying to relax with a cigarette 3. whatever game they are playing is water proof, as if to say, we have had this rain issue before and we have addressed the issue with a water-proof solution.